'Ocean Retreat'. Stunning. Guests love it. Sleeps 12-14. Best value! Step into this 4000 plus square foot ten year old home and you won't want to leave. It's everything you would want from a fabulous beach home with all the amenities and updates and a whole lot more! 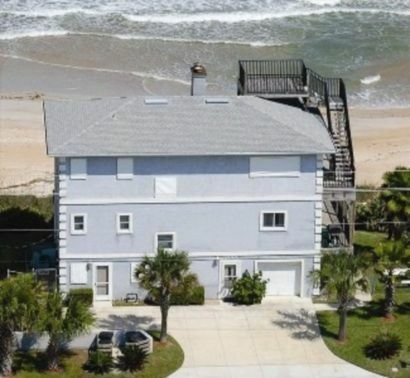 Six bedrooms and five baths for multiple families make this the best value on the beach! Let's start with the living areas ... three of them. The second level boasts an up-to-date kitchen, living room and dining room that seats eight ... all facing glorious ocean views off a spacious deck with some 10 wood deck chairs. This is where you will be living the good life. The third level features a living/game room with a foosball table, a second kitchenette and a spacious den with a large flat screen TV, again, facing the beach with a second deck. The first floor includes a game area with a TV, DVD, Playstation 2 and even a sofa bed as well. All this ... with high speed internet connection, gas grill, all the beach toys and chairs you need and your own private catwalk out to the beach.. and the fabulous Crows Nest for glorious views of the sunset. And, because we are members, your group can have access to The Serenata Beach Club two miles south for only $277 for the week ($305 in the spring/summer)... two pools, fitness center, bar and restaurant (8 people, excluding kids under 6). First class all the way. $58 for each additional person. Now, the bedrooms ... beautiful, private Master Bedroom Suite on second (main) level with queen, TV and whirlpool tub/shower...all just a turn of the head to the morning sunrise. Second MBS on third level with queen, TV and private bath with tub/shower. One additional bedroom has twins. Two bedrooms have bunk beds with a twin over a double. And the final bedroom has a queen. Add a couple airbeds for the kids or use the sofa bed and the home can sleep 14. Your Retreat is ready for you. 15 minutes from downtown St. Augustine and 15 minutes from Sawgrass in Ponte Vedra. See you soon! Amazing view from every floor . Gorgeous home! nice big house.right on the beach.everyone loved it. We had a wonderful stay at the end of December/early January. The proximity to the beach was ideal. We were able to walk for miles north and south, encountering minimal people. The bedrooms and common areas were spacious and accommodated our extended family group of 11 with room to spare. The kitchen had everything we needed to cook meals from pots/pans and dinnerware for a large group to spices. We appreciated all of the bathrooms so that no one ever had to wait. We had a minor issue and the property managers addressed it right away. Thank you for allowing us to use your beautiful home! Great home for large family! We had a group of 12, and the house worked great for us! Rick and Jenny were very responsive to any questions that we had. The location was like having access to our own private beach! Thanks again! Wonderful time at this beach house! The view from the main level kitchen and family room was fantastic. We could see and hear the waves coming in and it was very relaxing to sit on the balcony and enjoy the outdoors. The kitchen was well supplied and with 9 people we really appreciated having so many bathrooms. This house was the perfect fit for our very large family. Plenty of room for everyone to be together or to be alone if you wanted. The beach was very quiet and even the weather was mostly (!) in cooperation. Highly recommended for large families.